An off-duty NYPD officer fatally shot a man during a road rage-fueled shooting in East New York early Monday, police said. BROOKLYN — State Attorney General Eric Schneiderman is launching an investigation into the death of a man fatally shot by an off-duty NYPD officer during a road-rage incident in East New York over the holiday weekend. 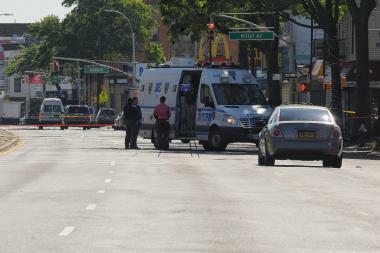 Delrawn Small, 37, was shot by off-duty NYPD officer Wayne Isaacs at a stop light at Bradford Street and Atlantic Avenue after an altercation just after midnight on July 4, according to the state Attorney General's office and officials. Tuesday, Schneiderman announced that the shooting falls within the parameters of Gov. Andrew Cuomo's 2015 executive order empowering the attorney general to investigate incidents during which unarmed civilians are killed by police. The probe will be led by Alvin Bragg, who heads the special investigations and prosecutions unit. The news came as friends and family members prepared for a candlelight vigil on the street corner where Small was killed at 7 p.m. on Wednesday. "They're hurting," said State Assemblyman Charles Barron of Small's family. "They're planning for a funeral. They're in a lot of pain. Imagine: from celebrations to a funeral." Small had 19 previous arrests, according to records. He spent three stretches behind bars for three separate felony convictions, according to the state Department of Corrections. From mid-1996 to late 1999, Small served time for attempted robbery; a drug-dealing conviction landed him in prison from 2002 to 2005; and from 2006 until 2010, he served time for an assault conviction. In 2014, Isaacs was accused of using excessive force by a Brooklyn man named Arthur Whaley, according to Schneiderman's office. Whaley claimed in a civil lawsuit that a group of five officers, including Isaacs, accosted him in Bedford-Stuyvesant on July 6, 2014. He said he was knocked to the ground, punched, kicked and struck several times in the head and body with fists and batons. One of the officers also called him a "n---er." While at the precinct, Whaley said he was denied requests for water, a telephone call and medical treatment. He also said $96 was taken from him and not returned. Whaley was awarded $20,000 in a settlement reached with the city in April 2015.